Can I Copy VHS Videos and DVDs on a DVD Recorder? You can make copies of VHS tapes and DVDs using a DVD Recorder as long as they are non-commercial home-made recordings. This means that DVD recorder can be used to copy camcorder videos and videos made from TV shows, and can also copy Laserdiscs, and other non-copy-protected video material, but DVD recorders cannot bypass the anti-copy signal on commercial VHS tapes or DVDs. If a DVD recorder detects the anti-copy signal from a commercial DVD it will not start the recording and display a message on the TV screen or its front panel display that it detects the anti-copy code or that it is detecting an unusable signal. The steps for making a copy to a DVD recorder are straight forward. Connect the AV outputs of the VCR to a corresponding AV input on the DVD Recorder. Select the input on the DVD recorder that the VCR is connected to. Turn on the VCR and DVD Recorder. Insert the VHS tape you want to copy in your VCR and place a blank recordable DVD into the DVD recorder. Choose the DVD Record Mode — How much time recording time you want on your DVD. Start the Record function on the DVD recorder, then press Play on the VCR. The reason you need to start the recording process on the DVD recorder before starting play on the VCR is to make sure you don't miss the first few seconds of video on the VHS tape. The copy process is done in real time (a two-hour tape takes two hours to copy). When done, stop the VCR and DVD recorder. Instead of connecting a separate VCR to a DVD recorder, you can also opt to use a DVD recorder/VHS combo, which combines a VCR and DVD recorder in a single unit, eliminating the need for external connection cables as they are internal. Some DVD recorders also have built-in hard drives. This allows you to copy the contents of a VHS tape to the hard drive as an intermediate step. From the hard drive, you can review your recording, and make a straight dub to DVD or make some basic edits, such as cutting out commercials or sections before making your final DVD copy. For more details on the above procedures and options, as well as other alternatives, refer to our companion article: Three Ways to Copy VHS to DVD. To copy a DVD to another DVD using a DVD recorder, the steps are similar to copying a VHS tape to DVD with a DVD recorder, but you need to take the following into consideration. 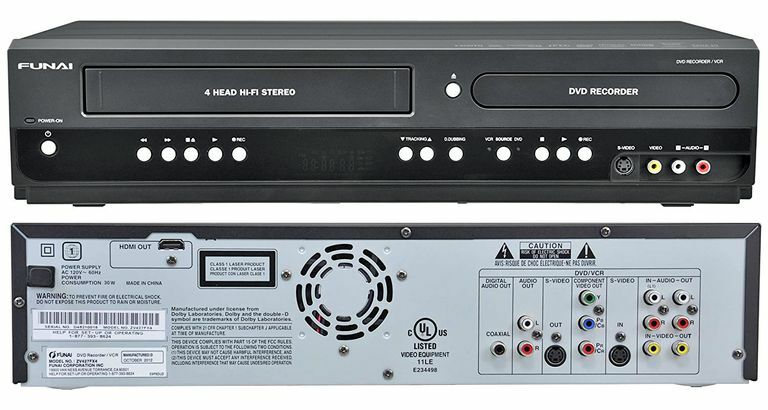 When connecting a DVD player to a DVD recorder, you are limited to using DVD player's composite or possibly S-video outputs (if available) to connect to the DVD recorder. Although your DVD player may have component and/or HDMI outputs, you can't use these connection options as DVD recorders do not have component or HDMI inputs. As a result, the copy will not be DVD-quality since you can't use those higher-resolution/quality connection options. DVD recorders do not record Dolby or DTS surround sound as they do not have digital optical/coaxial audio inputs. Since DVDs use a menu structure, you need to start playback from the DVD menu so they can be copied. The DVD recorder will not automatically copy all the contents of the DVD. You cannot copy the interactive menu functions of a DVD. A DVD recorder creates its own menu functions, it will not duplicate the function menu from another DVD. If you want to make copies of DVD special features or alternate versions featuring commentaries, or alternate language versions, you will need to copy each separately. Just as with copying VHS to DVD, if you copy your DVD first to the Hard drive of a DVD Recorder/Hard Drive combo unit, you can review it and perhaps make some basic edits. Although copying from VHS or DVD to a DVD Recorder has to be done in real time, if you copy your video first onto the hard drive of a DVD recorder/Hard drive combo, the copy made from the hard drive to the final DVD copy can be done in faster than real time, based on the disc writing speed that the DVD recorder and blank disc supports. Although you need to connect your VCR and DVD recorder (or a separate DVD player to a DVD recorder) together to make copies, if you are also using your VCR and DVD recorder to watch as well as copy tapes and discs, you should not hook up a VCR and DVD recorder into the same path to your TV. Even if you are not recording anything, when you play a commercial DVD on your DVD recorder and the signal has to go through your VCR to get to the TV, the anti-copy signal will trigger the VCR to interfere with the playback signal of the DVD, making it unwatchable on your TV. The same effect is present if you have your VCR hooked into your DVD recorder before the signal reaches the TV. A commercial VHS tape with anti-copy encoding will cause the DVD recorder to interfere with VHS playback signal, causing the same effect on your TV. Copy-protection effects are not present on tapes or DVDs you made yourself. If your TV only has one set of AV inputs, you can connect the RF (Antenna/Cable) output of your VCR to the TV's RF (Antenna/Cable) input and the DVD recorder to the single set of AV inputs. You can also opt to get an AV switcher to place between the VCR and DVD recorder and your TV. Connect the VCR and DVD recorder to separate inputs on the switcher and connect the switcher's output to the TV. Although DVD recorders can make copies of VHS Tapes and DVDs under certain conditions they are becoming very rare, and VCRs have been discontinued, so finding a replacement is increasingly difficult. If you plan to copy VHS tapes and DVDs using a DVD recorder, do so before this option is no longer available.